This is a great tasting bread that goes wonderfully well with a strong cheese and chutney. It's easy, and quick to make, and the recipe can either make one large loaf, or can be split into mini loaves, if you want to be a bit fancy for a dinner party. Weigh the water and gradually add to the dry ingredients until you have a soft pliable dough. Place the dough on to a lightly floured, flat surface and knead for 10 minutes or use the dough hook of a mixer at speed 1 for 8 minutes. You can tell if the dough is ready by doing the windowpane test. If it is not ready knead for another couple of minutes. Put the dough back in the bowl and leave to rise for an hour. Bring the dough out and mix the sultanas and walnuts into it. Shape the dough into a round loaf shape and place on a baking tray. 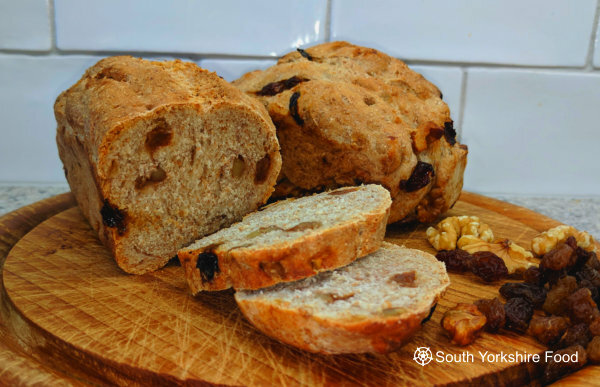 Alternatively split between four mini loaf tins (300ml size).Tip: If you leave sultanas sticking out of the top of the dough they tend to burn, so gently push them back into the dough. Leave for another 30 minutes. With a sharp knife, cut a line down the centre of the loaf, or mini loaves. Bake for 30 minutes, or until golden brown. Cool on a wire rack.